The American Psychological Association just released the following press release regarding the involvement of psychologists in the Bush Administration’s interrogation techniques. For background, see this prior post (link). WASHINGTON — The American Psychological Association (APA) today announced an initial series of policy and procedural steps in response to findings of individual collusion and organizational failures in the group’s activities related to the Bush Administration’s war on terror. The actions come as the APA released a 542-page report produced by attorney David Hoffman, of the Sidley Austin law firm, detailing the relationship between various activities of the APA and Bush Administration policies on interrogation techniques. Mr. Hoffman was retained by the APA Board of Directors last November to conduct a thorough and independent review, and the APA cooperated fully during the eight-month process. The Hoffman report states that the intent of the individuals who participated in the collusion was to “curry favor” with the Defense Department, and that may have enabled the government’s use of abusive interrogation techniques. As a result, the 2005 PENS report became a document based at least as much on the desires of the DoD as on the needs of the psychology profession and the APA’s commitment to human rights. “Our internal checks and balances failed to detect the collusion, or properly acknowledge a significant conflict of interest, nor did they provide meaningful field guidance for psychologists,” said Dr. Nadine Kaslow, chair of the Independent Review’s Special Committee. “The organization’s intent was not to enable abusive interrogation techniques or contribute to violations of human rights, but that may have been the result. In response to the Hoffman report, the Board initiated several actions and made additional recommendations to the APA’s governing Council of Representatives. The full list is attached. Approve the substitute motion of Council New Business Item #23B, which clarifies the role of psychologists related to interrogation and detainee welfare in national security settings and safeguards against acts of torture and cruel, inhuman or degrading treatment or punishment in all settings. Create specific criteria for emergency action by the Board. Additionally, the report confirmed that the organization’s 2002 change in its Code of Ethics was not the product of collusion. Mr. Hoffman “did not see evidence” that the revisions “were a response to, motivated by, or in any way linked to the attacks of September 11th or the subsequent war on terror. Nor did we see evidence that they were the product of collusion with the government to support torture.” As the organization has repeatedly stated, the ethics code was revised to provide a defense for psychologists when their ethical obligations on client confidentiality conflicted with court-ordered directive ordering disclose of confidential patient information. The actions below were approved by the Board or recommended for consideration by the APA Council of Representatives in response to the Report of the Independent Review Relating to APA Ethics Guidelines, National Security Interrogations and Torture. Recommend that Council approves the establishment of a Commission comprised of psychologist members and non-members, as well as experts from other fields, to evaluate and recommend changes to APA Ethics processes (including, for example, the establishment of a Chief Ethics Officer), based on an assessment of current practices and procedures, as well as benchmarking with ethics processes of other professional organizations. The Board will establish a mechanism for immediate oversight in the processing of filed ethics complaints including review of current adjudication and investigative procedures, and for ensuring transparency and accuracy in the disclosure of current ethics office practices. Recommend that Council adopts a policy to prohibit psychologists from participating in the interrogation of persons held in custody by military and intelligence authorities, whether in the US or elsewhere, but allowing them to provide training to military or civilian investigative or law enforcement personnel on recognizing and responding to persons with mental illnesses, on the possible psychological effects of particular techniques and conditions of interrogation, and on other areas within their expertise. Recommend that Council approve the substitute motion of Council New Business Item #23B. Council and the Board will collaborate to create governance constraints that address boundaries and appropriate oversight of elected and appointed officials, including Council, the Board of Directors, and boards and committees. Council and the Board will collaborate to establish civility principles and procedures that promote respectful space for all voices and perspectives and define professionalism, including through the establishment of a moderator role for listservs. The Board will direct the CEO to ensure an appropriate balance of autonomy and oversight in the supervisory process with respect to financial decisions, business processes and standards, and other activities, and if needed, adjustments in the workloads of administrators that may constrain their capacity for oversight and supervision. Recommend that Council adopts formal guidelines to ensure that all relevant policies are anchored in APA core values, including promoting human rights, human health and welfare, and ethics. Recommend that Council charge the Strategic Planning Advisory Committee with considering ethics, organizational restructuring, and human rights. This will assist in re-setting the organization’s ethical compass, and re-asserting our commitment to “do no harm” as a core value. The Board will increase APA’s engagement around human rights activities and its collaboration with other organizations regarding these issues. The full Hoffman report is available (PDF, 2.62MB) on the APA website. This afternoon the President is slated to hold a news conference regarding the declaration against ISIL. The full text from the Senate website is below. This will debated and voted on soon according to media reports. In this joint resolution, the term ‘‘associated persons or forces’’ means individuals and organizations fighting for, on behalf of, or alongside ISIL or any closely-related successor entity in hostilities against the United States or its coalition partners. The Authorization for Use of Military Force Against Iraq Resolution of 2002 (Public Law 107– 243; 116 Stat. 1498; 50 U.S.C. 1541 note) is hereby repealed. It is too early to know many details but a shooting has taken place on a Christian college campus in Seattle. KIRO-TV has a running commentary on the incident at Seattle Pacific University. The suspect is in custody, and the search for a second suspect has been called off. Authorities think they have the perpetrator. Another shooting on a college campus; this is chilling for anyone but especially for those of us who work in what feels like a pretty safe place. My prayers go out to them. Duck Dynasty to Leave A&E? I wondered what the rest of the clan would do. I suspect they will hold out for A&E to allow Phil to return to the show. If not, this may be the last season. Author Warren ThrockmortonPosted on December 19, 2013 Categories Breaking news, Cultural news, Media and society, Religion and sexualityTags A&E, Duck Dynasty, Phil RobertsonLeave a comment on Duck Dynasty to Leave A&E? I was a part-time, topic producer for Janet Mefferd until yesterday when I resigned over this situation. All I can share is that there is an evangelical celebrity machine that is more powerful than anyone realizes. You may not go up against the machine. That is all. Mark Driscoll clearly plagiarized and those who could have underscored the seriousness of it and demanded accountability did not. That is the reality of the evangelical industrial complex. I’ve read much speculation online, which is understandable given the confusing situation, most of it dead wrong. Being limited in what I can share, let me just say that truth tellers face multiple pressure sources these days. I hosted a radio show for 23 years and know from experience how Big Publishing protects its celebrities. Anything but fawning adulation for those who come on your show (a gift of free air time for the author/publisher by the way) is not taken well. Like Dr. Carl Trueman so aptly asked yesterday in his column at Reformation 21, does honest journalism have any role to play in evangelicalism now? (It was rhetorical.) My own take on that question is, no, it does not. The moment hard questions are asked, the negative focus goes on the questioner, not the celebrity, when there is something that needs scrutiny. Those who have the temerity to call out a celebrity have tremendous courage. The easiest thing in the world is to do fluffy interviews with fluffy guests on fluffy books. So hats off to those like Janet who have the courage to ask at all. And my own opinion on Mr. Driscoll is that despite the bravado, despite the near silence of his Reformed peers and enablers, his brand is damaged, and damaged by his own hand. To follow the conversation, go on over to Spiritual Sounding Board. Earlier today, I asked Janet Mefferd for an interview regarding her statement yesterday. In an email, she declined to comment. UPDATE: The comments have now been removed with comment from Julie Ann at Spiritual Sounding Board. 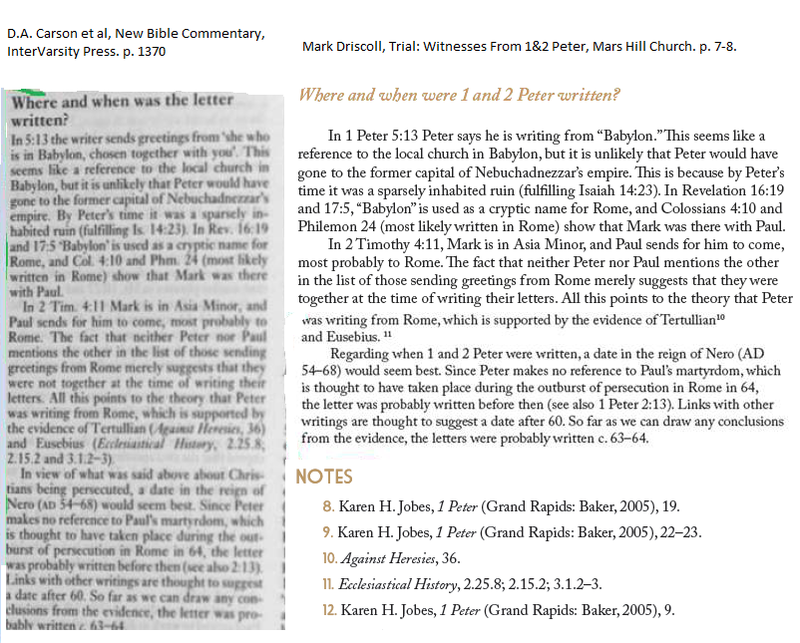 Here is another side-by-side comparison of material from Trial: 8 Witnesses from 1&2 Peter and New Bible Commentary. This image contains different material from what I posted earlier this week. Just a few minutes ago, in a stunning about face, Janet Mefferd disclosed that she removed from her website the interview with Mark Driscoll that prompted charges of plagiarism. She also removed all of the visual evidence of plagiarism and apologized to her audience for her conduct during the interview. Saying she should have gone to Tyndale House first, she expressed regret that the matter had become a controversy among Christians. For most of the morning, observers on social media had noted that her blog was down and her twitter feed had been purged of references to the controversy. In her brief announcement, Mefferd did not indicate what triggered the change of mind. It strikes me that the horse is already out of the barn on this. Ironically, her 4pm guest is slated to discuss Christian celebrity culture. Before we go to break, I just want to say something really, really quickly to you. A few weeks ago, as many people know, I conducted an interview with pastor Mark Driscoll. And I received lots of feedback on that interview, both positive and negative, but I feel now that in retrospect, I should have conducted myself in a better way. I now realize the interview should not have occurred at all. I should have contacted Tyndale House directly to alert them to the plagiarism issue. And I never should have brought it to the attention of listeners publicly. So I would like to apologize to all of you and to Mark Driscoll for how I behaved. I am sorry. Unfortunately, I didn’t anticipate that the story would go viral online the way it did and creating such dissension with the Christian community was never my aim. And so in an effort to right things as best as I can, I have now removed all of the materials related to the interview off my website, and also off my social media. Last evening, the Springboro School Board canceled two Constitution classes which had drawn protests from parents, teachers and students. Notice of the board action was posted on a Facebook site called Springboro United for Responsible Education. Some Springboro citizens had sent an open letter to the school board and created a petition at Change.org. Yesterday, I reported here on Institute on the Constitution’s ties to white supremacist group League of the South. While the cancellation is a step in the right direction, I am confident that parents and community groups will continue to press for answers to questions about why the IOTC was considered a viable resource. SPRINGBORO- Springboro Community Schools has cancelled two community education courses on the U.S. Constitution originally scheduled for this summer. The two courses were a 12-week course by the Institute on the Constitution scheduled to run from July 9 through September 24, and a one day seminar by the National Center for Constitutional Studies. Anyone currently registered for the 12-week course by the Institute on the Constitution should contact instructor Ricki Pepin at 937-322-3149 for a refund or other information. Those who registered for the seminar with the National Center for Constitutional Studies through Springboro Schools will receive a refund. This is now on the district website. UPDATE 1/5/13: But now see this: EAP Brochure describing homosexuality as an addiction. You had no desire before to verify any content that included us. You decline, as do others, to print the requested retraction. We are contacting the respective groups we feel should be aware of some events over the last several days. Beginning on December 20th and article (source unknown) began circulating on the internet alleging contact with us as well as slandering our company. As the entities were identified, contact was made and they were advised we had no knowledge of the article and had never been contacted despite being named as a source. They were each directed to post and publish retraction. As this is internet based it crosses both state lines and international boundaries making it a matter for federal offices and federal authorities. We ask that your office investigate as to the conduct of these groups and if within your reach to remove any operational privileges, rights, licenses, or other operational provisions. Bell is referring to a post I put up earlier today. I did not republish the Gay Star News story but instead referred to it as an illustration. I contacted Bell and then he replied indicating that he had not spoken to reporters. I changed my post to reflect his communication to me about the Gay Star News story on December 20. Mr. Bell’s complaint is with Gay Star News. It is perfectly reasonable to report what another source has said. In the event of a misquote or allegation of a made up story, it is also reasonable to report that which I did in the earlier post and am doing now.